A hearing will be held Saturday for two dueling bills, each charting a course with two very different routes, for Medicaid expansion in Montana. The current program, approved in 2015 and used by more than 96,000 Montanans, is set to expire June 30, 2019. House Bill 658 by Rep. Ed Buttrey, R-Great Falls, and House Bill 425 by Rep. Mary Caferro, D-Helena, will be heard by the House Human Services Committee at a 9 a.m. hearing in Room 303, also known as the old Supreme Court chambers. It is one of the larger hearing rooms, of the state Capitol. Medicaid expansion is one of the hot-button issues of the 2019 legislative session. Buttrey’s 45-page HB 658 may be considered the more extreme of the two proposals as it has a requirement for a quota of work or other activities. Caferro’s eight-page HB 425, known as "the Keep Montana Healthy Act," pretty much continues the program as is now and removes the expiration date of Montana’s Medicaid expansion. It continues Montana's voluntary job training program for recipients. There is at least one similarity, both bills include a fee of slightly less than 1 percent of hospitals’ revenue for outpatient services to help support the program. In exchange, the hospitals will get a higher reimbursement rate for services to Medicaid recipients. According to a fiscal note with HB 425, that fee is estimated to generate $38 million to $44.6 million a year from FY 2020 to FY 2023, with half funding Medicaid expansion and half helping to increase provider reimbursement rates for traditional Medicaid and the expansion program, Associated Press reported. The fee will not be paid by state- or county-owned hospitals. According to the fiscal note attached to the bill, HB 425 has an $8 million impact on the General Fund balance in 2020, and it ranges from $13-14 million for Fiscal Year 2020-2023. Buttrey’s bill, HB 658, has a new provision requiring people who receive coverage to do 80 hours of community engagement activities a month, if they are at least 19 but younger than 59. That can be done through a job, school, training programs or other programs. Some have expressed concern about this requirement. There was no fiscal note attached to the bill as of Thursday afternoon. 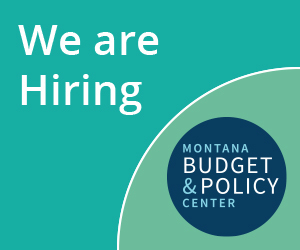 The Montana Budget and Policy Center, a nonprofit think tank that does research and analysis on budget, tax and economic issues, said Medicaid expansion has allowed nearly one in five (15,450) American Indians access to health care services statewide. On Thursday, Democrats said the Montana American Indian Caucus endorsed HB 425. On Thursday, Heather O’Loughlin, co-director, research and development with the budget and policy center, said HB 425 continues a successful Medicaid expansion program. “In contrast, HB 658 adds complex and harsh requirements that will be difficult and expensive to administer and will result in the loss of coverage for tens of thousands of Montanans, many of whom are already working,” she said. Rep. Dennis Lenz, R-Billings, head of the House Human Services Committee, said he expected the hearing to last well into the afternoon and hoped the committee would take executive action on it on March 22. He said he was not happy about getting Buttrey’s bill just a few days before the hearing, but added he wasn’t angry about it either. “I just wish it could have come out earlier,” he said. Lenz said he was undecided on the bills, but added he could not support Medicaid expansion continuing in Montana in its current form. House Minority Rep. Casey Schreiner, D-Great Falls, who supports Caferro’s HB 425, said the hearing will give people the opportunity to learn the differences between the two options. The state passed its version of Medicaid expansion, the Health and Economic Livelihood Partnership (HELP) act, in 2015 with a provision for it to sunset June 30, 2019. It wasn’t an easy task as in 2013, a Medicaid proposal was rejected by the state Legislature and a proposed ballot initiative did not qualify in 2014. In Montana’s version, participants had to make the maximum copayments allowed under federal law. But copayments and premium payments combined could not exceed 5 percent of a family's household income. At one time, the governor's office estimated 70,000 people or more would be eligible for coverage. The debate to continue the program is expected to be emotional. Sen. President Scott Sales, R-Bozeman, said Tuesday he was confident that Medicaid expansion will “pass in some form,” adding there were some members of the Republican caucus who would never support Medicaid expansion. He said he could never vote for it, saying the program is not sustainable and the federal government is putting more of the financial burden of the program on state government. Senate Minority Leader Jon Sesso, D-Butte, said he was not surprised by Sales' comments, saying they reflect views he has brought to the Senate floor for eight years. "I think a working majority in the Senate has a different view," he said. Sesso said there is a will to succeed on this issue. "There is no greater issue we have to accomplish," he said. "I think we will get it done because the people sent us here to get it done." The state's cost of Medicaid expansion is increasing as the federal share drops to 90 percent in 2020. State Senate Majority Leader, Fred Thomas, R-Stevensville, said it would be up to Republicans to make sure accountability is built into the legislation. The Tribune will provide coverage of the hearing.